Using low-power microwaves to penetrate surface every 0.2 sec, PCE-A-315 obtains interior moisture readings from grain without causing any damage. Measurement range is 5%–40% during continuous mass flow, and error is ±0.5% from 5%–18% grain moisture. Due to integrated temperature probe, readings are accurate from 41 to 131°F. Analyzer supports connection to evaluation software, data loggers, process controllers, and complete process control systems through RS485 and 4–20 mA interfaces. 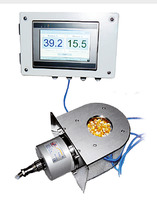 Jupiter, Fla. – PCE Instruments has introduced a new inline moisture meter, PCE-A-315, that provides exceptionally accurate grain moisture measurement in real time. The PCE-A-315 in-process moisture sensor boasts a measurement range of 5% to 40% for moisture content during continuous mass flow with an error of just ±0.5% from 5% to 18% grain moisture. In addition to remarkable precision, the PCE-A-315 inline moisture analyzer delivers significant cost savings. The PCE-A-315 lowers energy costs by enabling shorter drying times and reduces labor costs by automating the moisture monitoring process. Suitable for the continuous monitoring of moisture in corn, soybeans, wheat, rice, sorghum, barley, oats, rye, hops, coffee, cocoa beans, oil seeds, flax seeds, sunflower seeds, poppy seeds, pumpkin seeds, spelt seeds, buckwheat, sesame, peas, fava beans, scarlet runner beans, triticale, amaranth and jatropha, the PCE-A-315 in-process moisture meter uses low-power microwaves to penetrate the surface every 0.2 second and obtain interior moisture readings without causing any damage. An integrated temperature probe ensures the readings are accurate from 41°F to 131°F (5°C to 55°C). The PCE-A-315 inline moisture sensor can be connected to evaluation software, data loggers, process controllers and complete process control systems through interfaces such as RS 485 and 4-20 mA. Deployed successfully in hundreds of global grain processing facilities, the PCE-A-315 in-process moisture analyzer has proven to be consistently accurate over time. The unit is nearly maintenance free, as it does not need to be recalibrated very often to guarantee precise readings. Installation of the PCE-A-315 is straightforward and can be done by the customer with or without remote assistance from PCE Instruments. Onsite installation and technical support services are available throughout the United States, Canada, Western Europe and South America. To view a short video highlighting the features and benefits of the PCE-A-315 inline moisture meter, visit https://youtu.be/GZMLBT2W9dw. For complete technical specifications, see https://www.pce-instruments.com/f/t/us/inline-moisture-measurement.htm#product-1. For technical advice or to place an order, email info@pce-americas.com or call (561) 320-9162. About PCE Instruments / PCE Americas Inc.
PCE Americas Inc. is the North American branch of PCE Instruments (PCE), a leading developer, manufacturer and supplier of high-quality test, control, lab and weighing equipment, offering more than 500 different measuring instruments for applications in engineering, manufacturing, food and hygiene, aerospace and environmental industries. Founded by German engineers nearly two decades ago, PCE boasts a large product portfolio that covers a wide range of scientific instrumentation needs, from environmental testers and moisture analyzers to lab and industrial scales and balances, video inspection cameras and sensor equipment. In addition, PCE’s development department can provide specialized measurement products and solutions on demand. For more information, visit https://www.pce-instruments.com/english/pce-instruments-test-instruments-anbieter_2.htm .